Late flight? Stuck on the tarmac? Lost luggage? Cancelled flight? Yes, these are ALL an annoying part of air travel. 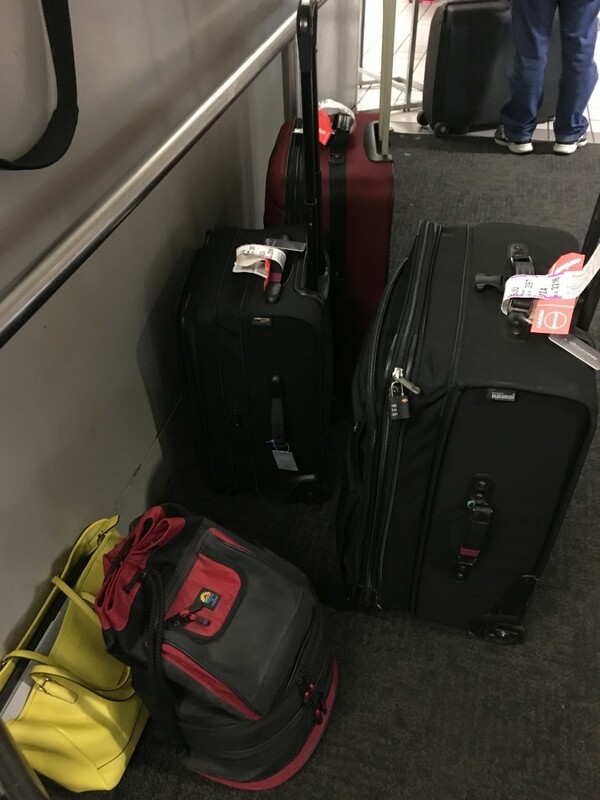 As a frequent flyer, and former airline employee (a brief 2 years in IT, focused on baggage handling), I am amazed at everything travelers blame on the airline. Some things are absolutely the airlines fault (like giving your seat away and rude employees), while other problems must be blamed elsewhere. Cancelled or delayed flight due to weather? The irresponsible airline partnered with the FAA and decided that your safety was important. Flying in bad weather can result in wild turbulence (barf bags are provided for this reason). There is a high risk of circling the airport before cleared by the airport tower to land, which can lead to diverting to another airport for refueling and no way for an on-time arrival! Or, worst case, really bad weather can result in a plane crash and possible death – airlines try to avoid this, aircraft is expensive to replace and they lose all those frequent flyers! Turbulence? Also, not the airline or pilot’s fault. Storms happen, some which can result in a bumpy flight. The pilot can request a higher altitude, or route change, but it is only a request. Sometimes, the only option is deal with the turbulence, or land immediately (not necessarily at the origin or destination airport). Cancelled or delayed flight due to mechanical issues? Blame the Airline – This is the equivalent of maintaining your car. Many things are avoided by preventative maintenance. While others just happen due to wear and tear. Considering how many miles these aircraft cover, I am content when they ground a flight due to “check engine light”, or anything that could result in a crash! Someone opened your luggage? It was probably TSA, and they will leave you a little love note (Notice of Inspection), or possibly Customs if travelling internationally. Neither TSA nor Customs are employed or in any way controlled by the airline. Both TSA and Customs can open your luggage for any reason, or random inspection. They can remove items deemed hazardous or restricted, and sometimes your fancy electronics or cash look hazardous – do not pack tempting items in your checked luggage! I was on a TSA tour in the PHL airport screening, where TSA showed me a full size (opened) bottle of liquid laundry detergent that was deemed hazardous and removed. There was massive paperwork for this one item, which allows the owners to submit a claim against it. Removing this one bottle also resulted in the luggage to miss its connecting flight. No airline personnel were allowed to touch the bag or contents while TSA had control. The airline is blamed for mishandled luggage, even while in TSA custody. There are many convicted ex-TSA agents that are responsible for stealing items from luggage, here is one example. For many airports, a large portion of the baggage handling system is automated. The human interaction (opportunity to steal) is limited, by design. With the rush for on-time departure, there is very little opportunity for airline employees to steal anything. That being said, ticket agents (checking your luggage), Baggage Service Office (BSO) agents when your luggage is delayed or missing, and reroute bag agents do have access to your bag and pose the greatest risk for theft (these are airline employees, so Blame the Airline hiring department). Damage to your luggage? Again, since a large portion of the baggage handling system is automated in various airports, this could be the airports fault on conveyor belts, TSA (they can cause damage while they are inspecting your bag and removing things), airline baggage handlers, or the airline conveyor belt into and out of the belly of the aircraft. Airlines are somewhat accommodating for damaged luggage, if you go to the Baggage Service Office (BSO) and file a claim immediately. Show them the damage to your luggage and anything inside. One of my checked bags had an unfortunate run-in on a conveyor belt that ripped a massive hole through the top, rendering the bag utterly useless and destroying a wool coat. I filed a claim as soon as I picked up my bag from baggage claim. The airline replaced the bag, with a very cheap duffle bag, and paid (a reasonable) replacement cost for the coat. Make sure the next time air travel is less than perfect that you direct your frustrations in the correct direction. Above all, be polite, factual, and understanding who is to blame. Want better service when it is the airlines fault (or not)? Join the frequent flyer program and rack up a few trips. A little flyer status can go a long way towards better service, free checked bags, first class upgrades, lounge access, and many other great perks! Thanks for sharing this wonderful piece of information! Unfortunately, we all have to tackle all these challenges while traveling! It is absolutely unfair to blame the airline for each and every misadventure. I’ve seen people cursing the airline employees because they missed their flight? Why? Because they reached the check-in counter 20 minutes after it was closed. The Airlines usually end up being the punching bag, many a times even though they are not at fault. It is imperative that we understand the broader perspective of the environment in which the Airline operates, as this will give the right picture. I was stuck at the airport once for almost half a day due to bad weather conditions. It was not really the fault of the airlines cause if the weather isnt suitable no point in risking people’s lives. But that was one hectic flight. Interestingly it was only a matter of 2.5 hours but the delay made it a long ordeal making all 150 passengers wait in the airport from 5:30 in the evening till 11:30 at night when the plane finally took off and we reached our destination early next morning. This was helpful to know about. In general the only problem I have with airlines is when they charge me to check a bag! 🙁 I remember when they didn’t do that and I wish they’d stop. I’m very loyal to airlines like KLM or TAP that let me fly without paying to check my suitcase. But you’re right to say that it’s good for the airlines to not fly if the weather is bad. Thanks for this informative post. Here in the Philippines airline companies always take a bad rap for delayed and cancelled flights – mainly due to traffic congestion in the airport, bad weather or necessary repairs. I think it’s time that people also get properly informed on the other side of the story. I know it’s not the airlines fault but when it comes to turbulence I always have to find someone to blame lol … I have had my bags miss its connection due to flight delays (weather/mechanical issues) and bags destroyed. Wish I had known previously I could contact the airlines for reimbursement or atleast some form of assistance. Great post! Interesting. For me as frequent traveller, the only thing that worries me are missing luggages. The rest are not a big deal. It’s so important to share some of those points! When we travel a lot, and we don’t know to whom we can direct our frustration, it’s sometimes unnecessary to direct it against the line steward. As for the turbulence, it’s so stressful but the weather ain’t something you can act on! Haha. Great post really! I fly a lot and have been flying since I was 4 years old. It is simply easier to just blame the airline for everything rather than considering the other factors. I used to get worked up over this stuff but now I just see it as one of those things that can happen. very nicely worded. Its amusing to see people blame everyone for something not their fault. Really nice post and you are right! Talking about luggage I mostly travel only with my handle bag so I don’t have to worry they can send my stuff to other continent or my bag can be damaged. It’s due to economic reasons- when you travel by cheap European airlines you have to pay for your registered luggage, but also because I don’t like feel like to move my home with me. But the annoying thing is even when you travel only with handle luggage you have to be on the airport earlier and then you have to wait… I don’t like it. When I first saw the title of this article, I was afraid it would be a piece about blaming the airline to get compensation. I can’t stand those types of articles, as they promote the exact type of travelers that I cannot stand dealing with as an airline employee. I’m glad I read your post, because I agree with it 100 percent. While there are some things within the airline’s control, so many issues are not–and the general public blames it on the airlines (and, as a result, on the flight attendants/agents) when they have nothing to do with the issue. As an example, on a recent flight there was a fuel leak and hydraulic issue that resulted in a lengthy delay. One passenger nearly spat in my face and proceeded to tell me that I sucked, due to her missed connection. I’m sorry, but A) I did not break the aircraft and B) shouldn’t she be glad that this issue was discovered on the ground? Glad you enjoyed! More people need to be reminded that SAFETY is the number 1 concern for the flight, and I am happy about that! Good article, we don’t appreciate what truly goes on behind the scenes so that we can fly away to far away places! Exactly! And acknowledging it is not someone’s fault when you are asking for help goes a long way!